Looking out over Coyote Valley, the built environment of San Jose is visible. I can see the literal outlines of "Silicon Valley": buildings and "campuses" housing Genentech, IBM, AMD, Yahoo, etc. Measured by the billions of people who are virtually linked through just two of these behemoths, Google and Facebook, it's fair to say this is the center of the world as we know it. The anthropocentric world, that is. Behind me, the Santa Cruz Mountains. Over on the other side of the Valley, the Diablo Range. All is green right here but not exactly quiet. A fluttering curtain of birds accompanies a tractor as it churns the Earth. The birds are after the rousted insects. Bigger birds -- more raptors hang out right here than anywhere else in California -- make stealth forays after the smaller passerines. 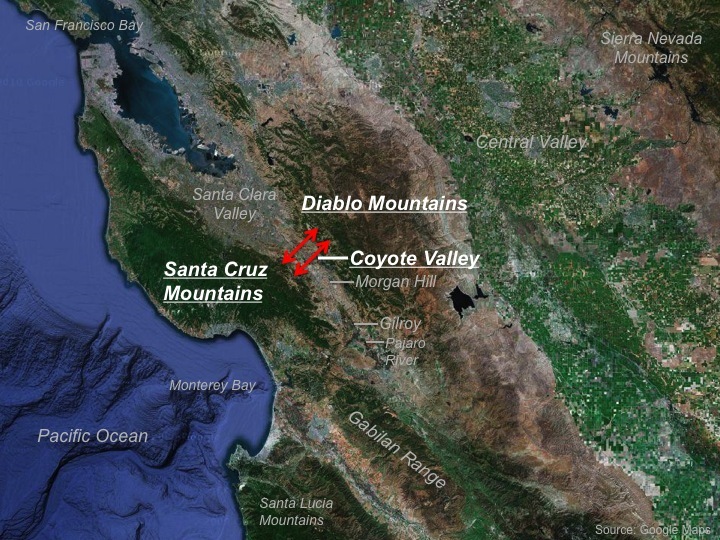 Coyote Valley is recognized by many as essential to the continued health of the greater San Jose area, to Santa Clara County, indeed, to the health of central inland as well as coastal California. This one little piece of land, 7,000 acres, is virtually the last relatively wild connection between mountain ranges. Much of it is agriculturally-purposed, but as the birds attest, the wildlife have made use of that. In turn, the birds of course keep pest populations in check, which benefits the farmers. Walking along Coyote Creek, hawks fly overhead; animals without wing power have to find a way to get across bifurcating Highway 101, and indeed they do, using an underpass. Their treks have been captured by cameras operated by wildlife corridor technicians from nearby DeAnza Community College. Not only is this territory prime for allowing critters to keep on keeping on, it also provides an outdoor lab for students learning how nature works. One of the reasons Silicon Valley has become such a popular locus for the technology revolution is that it is darn beautiful here. The weather is salubrious, perhaps too hot in the most intense part of summer, but mostly temperate. This is a place people want to live. It is one of the main tenants of conservation biology that keeping natural areas connected keeps all the works in motion. That means that the wilderness left here in Coyote Valley performs an outsized service in keeping San Jose/Sunnyvale/Santa Clara the highest performing metropolitan area in the United States (according to the Milken Institute). You would think armed guards would be on sentry to make sure a mountain lion passing from one range to another can do so without getting hit by a car. The Santa Clara Open Space Authority, in purchasing about 350 acres of Coyote Valley, have protected a bit of it. Coyote Ridge, visible across Bailey Avenue, is doubly spared from development because it is too hard to build on, and because it is habitat for endangered species including the Bay checkerspot butterfly. Various municipal habitat plans protect Coyote Valley at least through 2040 -- hopefully by that time, we will have learned to look at the landscape differently. Instead of seeing acres upon which to put housing development, we will see our own circulatory system, and we will understand our own role in helping it to flow.